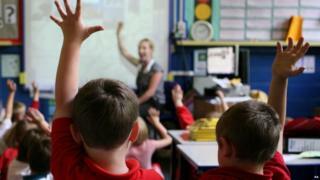 Save the Children says a quarter of boys in England - 80,000 - started reception class struggling to speak a full sentence or follow instructions. The report, based on a University of Bristol study, says children who start school behind often never catch up. A Department for Education spokesperson said "we are making a significant investment in the early years sector". The report compared girls' and boys' scores in the early language and communication goals of the Early Years Foundation Stage assessment. This assessment is taken at the end of Reception by all pupils in England. Children are expected to be able to listen and express themselves effectively, showing awareness of listeners' needs. They should be able to listen to simple instructions and answer "how" and "why" questions. Overall last year, 25% of boys were unable to meet these requirements, compared with 14% of girls. But for those on free school meals, the difference was more stark, with 38% of boys not meeting the standard compared with 23% of girls. The report found that there was no area in England where boys were outperforming girls in early language skills, on average. The gap between boys' and girls' EYFS scores was widest in St Helens, Merseyside, where 31% of boys did not reach the expected level compared with 14% of girls. The narrowest gap was in Richmond upon Thames at 5%. Here, 11% of boys did not meet the standard compared with 6% of girls. The report said it was not clear whether this early gender gap was the result of biological differences and rate of development, or social processes. But it quotes earlier research suggesting girls are more likely to be able to develop the behaviour and attributes, such as persistence, independence and flexible thinking, that enable them to learn. It also highlights how girls outperform boys at every level of education. The report concludes: "We cannot wait for disadvantaged children and boys to get to school before they receive the support they need. "By this time many will have already fallen behind, with negative consequences for their childhoods, school attainment and life chances. "We must invest in the best early years provision, led by early years teachers and supported by skilled staff at all levels, particularly in the most deprived areas." The director of poverty at Save the Children, Gareth Jenkins, said: "In England, too many children, especially boys, are slipping under the radar without the support they need to reach their potential. "They're falling behind before they even get to school and that puts their life chances at risk. "In 2016 this is unacceptable. A whole generation of boys is being failed." Responding to the report, a spokesperson for the Department for Education said "the number of qualified staff is rising with more trained graduates in the workforce and a record number of providers rated Good or Outstanding. "This investment is paying off, latest figures show more than 80 per cent of children are reaching the expected communication and language skills by age five, but we will continue working with the sector until every child gets the high-quality education they deserve."